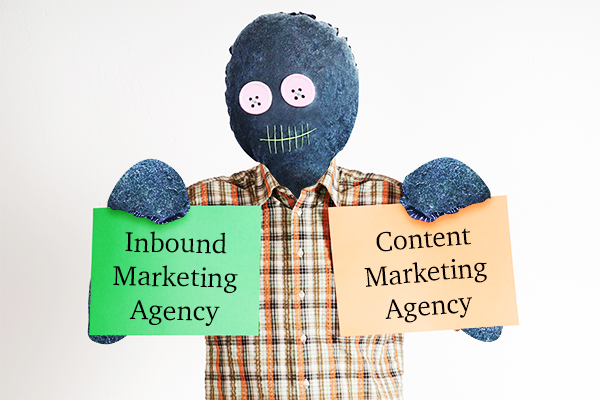 Content Marketing Agency vs. Inbound Marketing Agency: Which Do You Need? If you think these are just interchangeable terms, we’d like to set the record straight. Take a pause with us – at least long enough to understand the difference between these options and really understand which choice is hands down better for your company. Will content marketing agencies yield measurable results, or are inbound marketing agencies at the end of the day that all-around better approach? Can you handle these tasks in-house? Or is there another way to get the job done? Burning Question #1: What is Content Marketing? In January 1996, Bill Gates wrote an essay entitled “Content is King,” articulating his theory that content is where much of the real money will be made on the internet. Since then, Gates’ theory has become fact; great content has become a key way to maximize a company’s visibility. But the greatest content in the world isn’t worth anything if nobody is seeing it. But anybody who knows content marketing and has gotten their hands dirty in content knows that it just isn’t that simple because of one reason, and one reason alone: content marketing requires a deep knowledge of your industry. You need to know what topics are trending, where potential customers are getting their information from, and what keywords your target audience is using to search for information. Only then can you build that oh-so-impressive robust content marketing strategy that can be used not only to get you noticed, but to fuel your inbound marketing strategy. It should go without saying that creating a badass content marketing strategy, and the content to go with it, will also require a good deal of time. Hiring a content marketing agency that is familiar with your niche market is highly recommended for this reason alone: you’ll get to take advantage of the agency’s knowledge and marketing know-how which can supplement your own team’s skills and resources to integrate your content marketing into your broader marketing strategy. Burning Question #2: What is Inbound Marketing? If content marketing alone isn’t getting you where you want to be, inbound marketing may very well be what you need. Though both content and inbound marketing aim to attract highly-interested customers, inbound marketing pushes the envelope by accompanying (a.k.a. nurturing) prospective clients across different mediums during the sales cycle through automation. And Inbound marketing agencies will help you keep your company visible and relevant. You and you alone have got to be at the forefront of your audience’s mind when they’re ready to commit. But here’s another reason: inbound marketing is useful for B2B marketing where the sales cycle can be, and usually really is, long. Not just long, but super long. And research shows that inbound marketing can reduce the average cost of relevant leads by 60 percent. Working with an inbound marketing agency can turn strangers into clients (and even brand advocates) by attracting, converting, closing, and delighting your target audience. But like absolutely everything, there’s no one-size-fits-all approach: inbound marketing agencies require a holistic approach that includes lead nurturing. Agency strategies will need to include multiple disciplines including social media management, technical SEO work, email marketing, webinars, blogging, and more. And IMHO, HubSpot is one of the strongest tools we’ve found to integrate these channels into one central place and to give you an edge over your competition. Both content and inbound marketing are both keepers – but for very different reasons. Content marketing is essentially a subset of inbound marketing. There can be no inbound marketing without content. Content generation (even the best content generation!) without strong marketing efforts will not automagically get your brand positioned in the right place at the right time in the sales cycle. Solid inbound marketing activities cultivate your audience so that when they’re ready to buy, you’ll be the one they’re thinking of. If only there were a one-size fits all answer to this question…. But no such luck. Content marketing and inbound marketing are not one in the same at all, and what to choose really depends on your company’s goals. Working with a content marketing agency may be enough if your only goal is to provide your audience with excellent content. But if you’re relying on content to nurture and build relationships with prospects until they become clients, a content marketing agency is not quite enough. Inbound marketing agencies will help you understand and strategize: your buyer personas, the key search terms they are using, and what interests them during the various stages of the buying or nurturing process. The content strategy and what should be written when will be a direct derivative. The agency will also work with you on triggers and scoring that will determine when your prospect is ready to be contacted by you. Lastly, your agency will help you set up automation that will ease the nurturing process and provide insight into the marketing sales funnel; that is assuredly a part of their job. What do you need to happen? What are you short on?